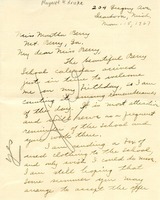 A letter to Mrs. Laura M. White from The Berry Schools thanking Mrs. White for her gift and discussing an imminent visit. 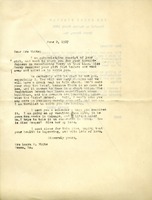 This letter was written on the back of an appeal letter to friends of the Schools for names of prospective new friends. 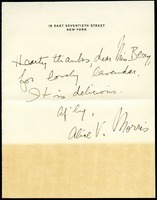 Alice V. Morris writes Martha Berry thanking her for the lavender. 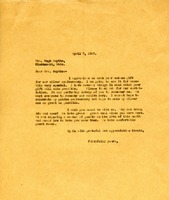 Martha writes to Miss Moore thanking her for the gift that she sent in her last letter. She hopes that Miss Moore is enjoying her new work and reminds Miss Moore that any donation of clothes or gifts would be greatly received. List of those to receive special gifts for Christmas. 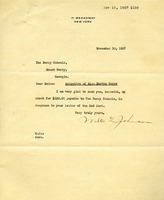 Walter Johnson writes to the Berry Schools and sends with the letter a check for 150 dollars. 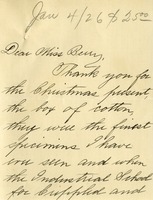 F. Coit Johnson writes in thanks for the Christmas cotton. 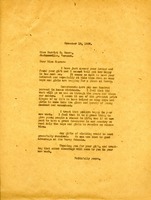 Alice S. Kirkpatrick writes in thanks for the Christmas cotton, and reports that her husband Mr. M.L. Kirkpatrick died in November. 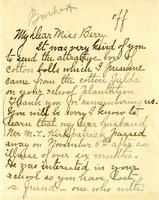 Mrs. Kirkpatrick regrets that she will not be able to continue Mr. Kirkpatrick's practice of giving to Berry. 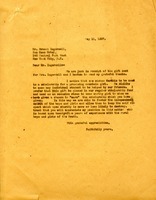 Mrs. Ingersoll has sent a gift for a scholarship. Martha Berry explains to Mr. Ingersoll how the gift will be used and expresses her appreciation for the gift. 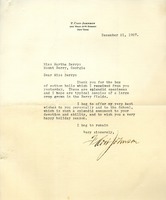 This is a thank you letter from Mrs. Kent to Miss Berry in regards to a Christmas gift of cotton.